Markets ended the week on a high note as JPMorgan kicked off the start of the Q1 2019 earnings season. The banking giant reported better than expected quarterly profits, driven by strong performance across its business lines. The report was reassuring for investors as the bank noted it remained optimistic on continued U.S. economic growth. JPMorgan’s results also served to give a boost to investor sentiment, suggesting the Q1 2019 corporate earnings will beat analyst forecasts. Meanwhile, economic news in the U.S. was relatively light, with reports on consumer and producer prices being the highlights of the week. Overseas, China’s March trade report provided more insight into the global economic environment as the country posted a strong surge in exports. For the week, the S&P 500 added 0.51%. China’s export engine roared in March, with dollar-denominated exports climbing 14.20% year-over-year (yoy) to $198.7 billion. The results were driven by an increase in exports to many of its biggest trading partners, but exports to the U.S. fell -8.50%. While their exports surged, China’s domestic demand proved to be weak as imports slumped -7.60% yoy to $166 billion. China’s closely watched trade surplus with the U.S. came in at $20.5 billion for the month. That was up from the $14.72 billion surplus it registered in February. Although overall exports rebounded strongly during the month, it is too early to tell if it is an indication of a rebound in global demand or simply due to seasonal factors such as improving weather and factories resuming operations after the Lunar New Year holiday. China’s domestic demand seems more certain to rise now that China has provided more stimulus. Consumer prices rose 0.40% in March, boosted by an increase in the cost of food, gasoline, and rent. Despite the rise in consumer prices in March, inflation year-over-year posted only modest growth. For the twelve months in March, prices were up 1.90%. That follows February’s 1.50% yoy gain, which was nearly a 2-1/2 year low. Core consumer prices, which exclude volatile food and energy prices, rose just 0.10% in March, matching February’s gain. In the 12 months through March, core consumer prices increased 2.00%, for their smallest increase since February 2018. That was down slightly from February’s 2.10% yoy increase. Overall, core inflation remains modest and roughly in line with the Fed’s 2.00% target level. Producer prices rose 0.60% in March, driven largely by a surge in the cost of gasoline and services. Gasoline prices rose 16% in March, contributing over 60% of the increase in consumer prices. Although gasoline prices were a strong contributor to producer prices in March, they are expected to moderate in the coming months. According to the Energy Information Administration gasoline prices are expected to average $2.60 a gallon this year, suggesting a drop is in store from the current price of $2.81 a gallon. This should trickle to consumers, who should also see some relief during the summer driving season, with gasoline prices forecasted to be down -3.15% from last year’s summer driving season. Excluding volatile food, energy, and trade services, core producer prices were unchanged in March. That follows a 0.10% increase in February. Core producer prices rose 2.00% yoy in March. That was down from the 2.30% yoy increase in February. Similar to what was seen in core consumer prices, core consumer price inflation remains very tame which should keep the Fed’s dovish monetary policy on track. Overall, it was a relatively quiet week as investors continued to wait for a U.S.-China trade deal to materialize and for the Q1 2019 earnings season to kick off. According to financial data provider Refinitiv, first quarter earnings are expected to fall -2.30% yoy and, excluding the volatile energy sector, earnings are expected to be down only -1.30%. Revenue on the other hand, is expected to increase 4.90% from the year ago quarter and again, when energy is excluded, revenue is forecasted to rise a healthy 5.50%. Considering companies have set the bar relatively low for earnings expectations on the backdrop of slow global growth and the early year government shutdown, it wouldn’t take much for companies to exceed expectations and set the stage for another quarterly gain for the markets. In observance of Good Friday, our office will be closed on April 19th, and the Probity Advisors, Inc. Week in Review will not be published. The New York Stock Exchange will also be closed on April 19th in observance of the holiday. Our next edition of Week in Review will return on Friday, April 26th with the first estimate of Q1 2019 U.S. GDP and the latest reports on the U.S. housing market. March Madness, along with Probity’s 2019 NCAA Championship office pool, kicked off on March 21st and concluded this past Monday, April 8th. The tournament started with a number of nail-biting games that came down to the final seconds and narrow margins of victory. Unlike last year, there were no major upsets in the first round. You might recall that in the first round of March Madness in 2018, University of Maryland Baltimore County (UMBC) beat University of Virginia (UVA) and became the first number 16 seed to win against a number one seed in the first round in the history of the tournament. The upsets and unpredictability are what make the tournament exciting, and it’s also what makes picking a perfect bracket nearly impossible. The odds of picking a perfect NCAA tournament bracket are a staggering 1 in 9.2 quintillion, that’s 9,223,372,036,854,775,808, according to Duke University math professor Jonathan Mattingly. Astonishingly, out of the estimated 60 to 100 million brackets filled out every year and entered into major online NCAA tournament bracket games, only one perfect bracket remained through the second round this year. A 40-year-old neuropsychologist from Columbus, OH correctly predicted the entire 2019 NCAA tournament into the Sweet 16. That’s 48 games out of the tournament’s 63! The odds of doing so are one in 281 trillion. When a writer from NCAA.com contacted Gregg Nigl to interview him about his bracket, Nigl had no idea he had the last perfect bracket in the world. Nigl shared that he filled out four different brackets this year, and almost did not complete his winning bracket but decided to do it because it was his friend’s pool. His bracket was busted at game 50 when Purdue beat Tennessee in overtime, but Nigl had correctly predicted that Gonzaga would beat Florida State in game 49 which is 10 better than the previous winning streak of 39 games. 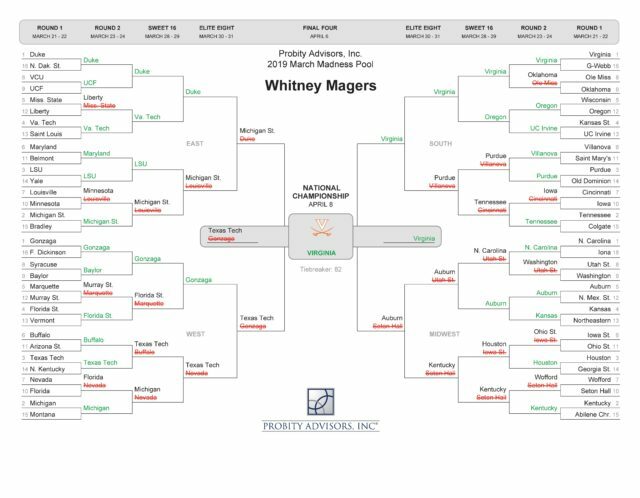 Probity’s 2019 office bracket challenge was as close as the final scores of the opening games of this year’s tournament. Whitney Magers barely edged out Buddy Ozanne to win the 2019 Probity March Madness Pool with 240 points versus Buddy Ozanne’s 238 points. Holman Moores came in just one point behind Buddy for third place, and Probity’s prior reigning three-year champion (2016, 2017, 2018) Alissa Kaiser accrued 225 points for fourth place. The scoring system Probity uses awards more points for brackets that successfully choose upsets, so if a lower ranked team beats a higher seeded team on a player’s bracket, that player adds more points to their running score. The secret to Magers’ success was selecting his alma mater, UVA, to win the tournament. UVA defeated Texas Tech in overtime and clenched the school’s first men’s national championship title. Magers graduated from UVA with a degree in finance in 1998 and attended UVA on an athletic scholarship. He was a kicker for the UVA football team and helped the Cavaliers win the ACC Football Championship in 1995. Magers has been an avid supporter of the Cavaliers ever since, remaining loyal — and hopeful — that UVA could get past last year’s devastating first round loss to UMBC. Magers’ allegiance to UVA sports has paid off. He is now tied for the winningest player for the Probity office pool in its 11-year history, and Alissa’s reign as the three-year champion (2016, 2017, 2018) has ended. Bye, Alissa! Important Disclosure: The information contained in this presentation is for informational purposes only. The content may contain statements or opinions related to financial matters but is not intended to constitute individualized investment advice as contemplated by the Investment Advisors Act of 1940, unless a written advisory agreement has been executed with the recipient. This information should not be regarded as an offer to sell or as a solicitation of an offer to buy any securities, futures, options, loans, investment products, or other financial products or services. The information contained in this presentation is based on data gathered from a variety of sources which we believe to be reliable. It is not guaranteed as to its accuracy, does not purport to be complete, and is not intended to be the sole basis for any investment decisions. All references made to investment or portfolio performance are based on historical data. Past performance may or may not accurately reflect future realized performance. Securities discussed in this report are not FDIC Insured, may lose value, and do not constitute a bank guarantee. Investors should carefully consider their personal financial picture, in consultation with their investment advisor, prior to engaging in any investment action discussed in this report. This report may be used in one on one discussions between clients (or potential clients) and their investment advisor representative, but it is not intended for third-party or unauthorized redistribution. The research and opinions expressed herein are time sensitive in nature and may change without additional notice.